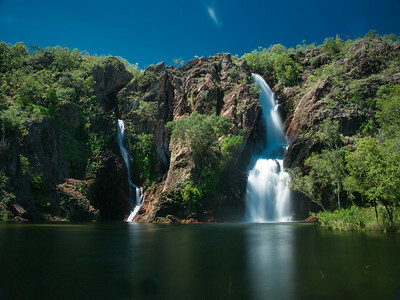 Wangi Falls in Litchfield National Park is a spectacular place to visit for great photography opportunities. During the Top End's dry season it is also a great place to swim and enjoy cool, clear water. Waterfalls provide an interesting range of shooting opportunities, with my preference being for silky smooth water as seen in this image. This image was created in the middle of a bright, cloudless day, so to achieve the silken look I used a Lee Big Stopper 10-stop ND filter. This resulted in a 25-second shutter speed at f/8.0. 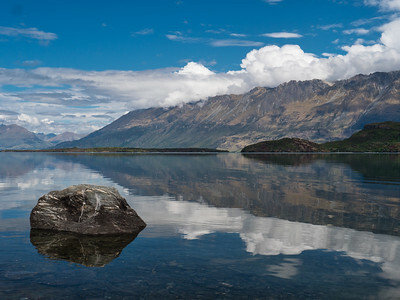 This slow shutter speed also resulted in a smooth surface on the lagoon, and enhanced the reflection of the waterfall. I like a good silhouette, but find this type of photography to be challenging. I think that's because there needs to be a healthy balance between light and shadow (balanced light), strong features, colour and negative space. 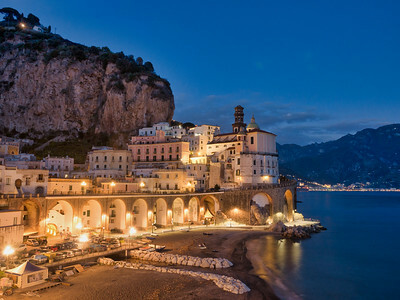 After making some sunset photos on the beach during our first evening in this beautiful Amalfi Coast town, I noticed this group of people down towards the water's edge. 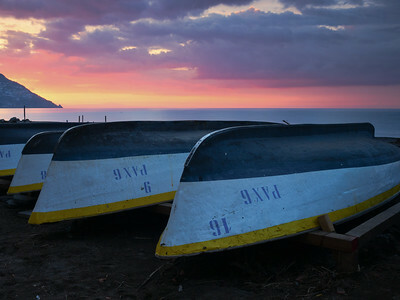 I moved to frame the main group with the sea behind them, and with the strong orange colours in the background. I then waited to get some interesting poses, taking multiple exposures as the group moved around and enjoyed the beach. In the off season (we visited late November) there are few crowds, so finding enough people while leaving plenty of negative space wasn't too challenging. Had there been larger crowds I would have to have framed the image differently. The strong contrast between light and dark was still a factor, even after sunset, so I made use of a 2 stop GND to manage the colour balance. With this the shutter speed was still quite fast at 1/50th, so getting a sharp exposure wasn't too challenging. The use of tripod still helped. 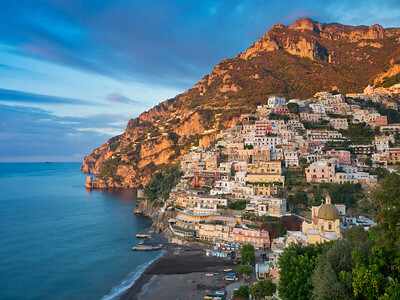 Like the other towns on Italy's Amalfi Coast Positano stretches from its beautiful coastline up into the surrounding mountains. 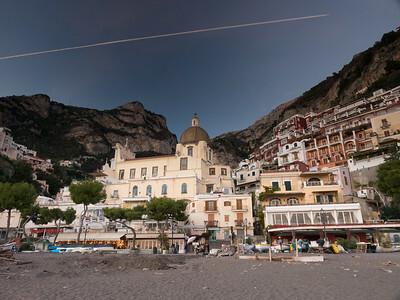 Standing on the beach, the signature dome of the church of Santa Maria Assunta is framed between an enclave in the ridge-line of the mountains. Buildings stretch much of the way up. 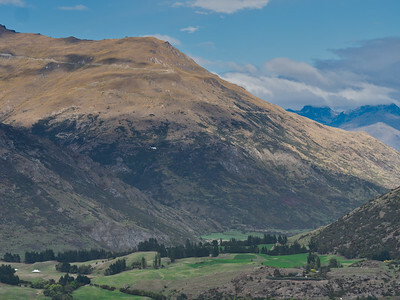 This image was made a few minutes after sunset, giving a love even colour across the buildings and hills. 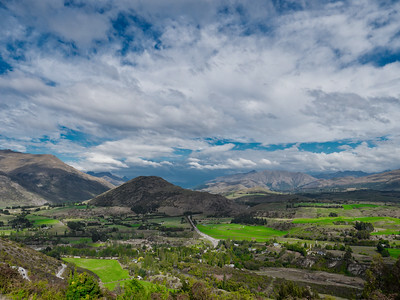 A tripod is an important tool in this type of imagery, as the relatively low shutter speed (0.4 of a second) would make a sharp image difficult to achieve if handholding. 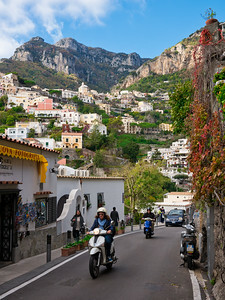 Apart from the lack of crowds, one of the distinctive things about low season in Positano is that the days are quite short. As the late great photographer, Galen Rowell, once said that "You only get one sunrise and one sunset a day, and you only get so many days on the planet. A good photographer does the math and doesn't waste either." 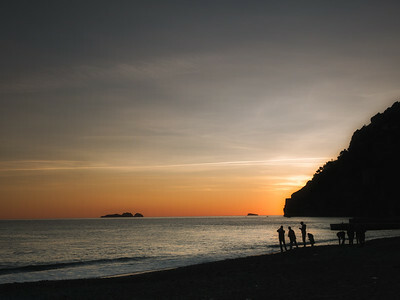 But it does make it easier when the sunrises and sunsets are at pleasant hours of the day. There are no excuses! 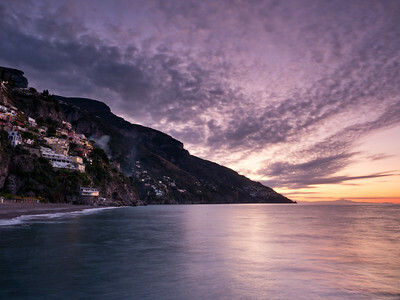 Standing on the western end of the main Positano beach, you look eastward down the Amalfi Coast to catch the sunrise. The clouds only accentuate the beautiful colours of the sky in the sunrise. A 3 stop GND and a relatively slow shutter speed meant that a tripod was an important part of ensuring a sharp image. 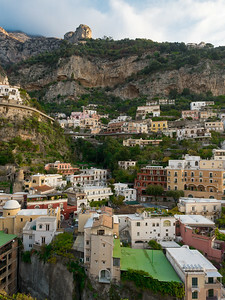 Positano in the low season is marked by low numbers of tourists, and with many of the hotel, restaurant and retail workers being employed seasonally, the township is very quiet. There are many opportunities to explore the streets, alleys and stairways without the crowds, and much of the time there are opportunities to make photos without any people at all—let alone crowds. This image was made walking back up from the beach after sunrise photos. 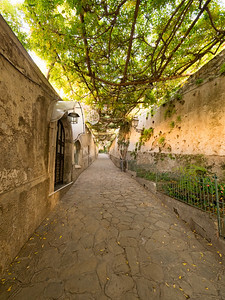 This is one of the main alleyways between the Piazza dei Mulini and the beach. We walked up and down this alley each day, and most of the time had it to ourselves. 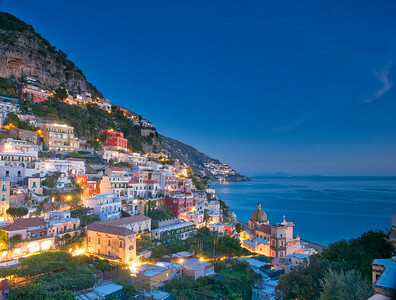 Positano on Italy's Amalfi Coast is a spectacularly stunning township, rising up from the sea into the heights of the surrounding mountains. 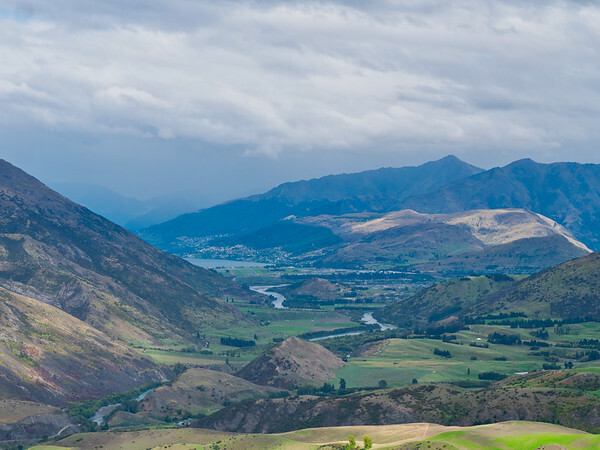 We visited in late Autumn, the low season for tourism, and we loved the fact that we could truly explore the coast, and the whole township without having to battle any crowds whatsoever. 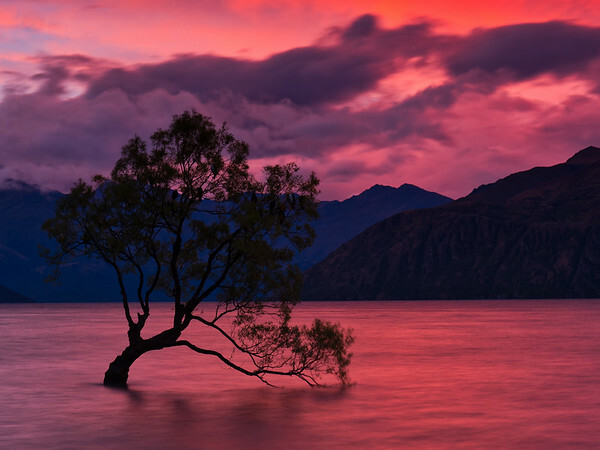 This image was made during the blue hour, shortly after sunset. Being winter sunset was quite early (4:39pm), and the blue 'hour' quite short - about half an hour. This short window meant that we had to scout early, then come back and setup early. Even though it was off season, there were some other photographers around and there are limited vantage points due to the cliff edges and narrow footpaths. 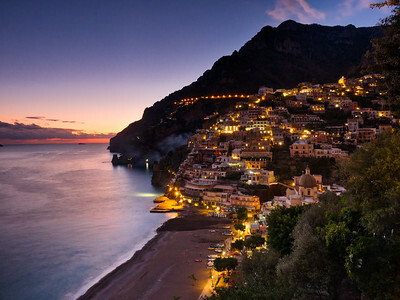 Positano is a wonderful place for photographers and non-photographers who want to explore a stunning coastline. 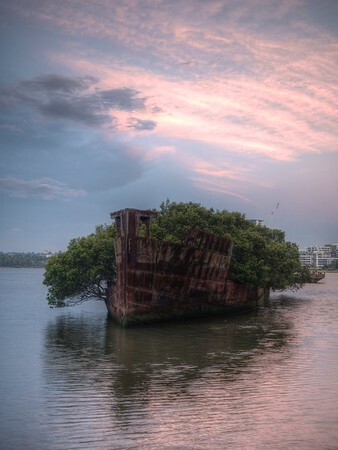 The SS Ayrfield is one of several old shipwrecks around Homebush Bay in Sydney's west. As an avid wreck diver and underwater photographer I have always enjoyed the challenge of trying to get images of shipwrecks. Challenging it is, as trying to get even a small wreck in an image is complex when you need to shoot through what is often gloomy water. To have the opportunity to capture images of a wreck in its final resting place, while shooting from shore is wonderful, and you can really take your time to make a variety of images. Built over 100 years ago, the SS Ayrfield was one of the '60 milers' – the name given to the numerous colliers that worked between Sydney Harbour and the coalfields of the Illawarra and Hunter regions. In 1972, the Ayrfield was sent to a ship breaking yard at Homebush, and is one of four wrecks that remain in place. Homebush Bay was once a hub of Sydney's heavy industry, and became a dumping ground for a lot of industrial waste, including the old ship hulls. Having been cleaned up, Homebush Bay became the home of the Sydney 2000 Olympic Games, and is now a residential, sporting and entertainment and business district. The old wrecks remain in place, and are popular sites for photography, particularly with the setting sun. Helensburgh is a small town that at the northern end of the Illawarra region and just south of the Greater Sydney area. 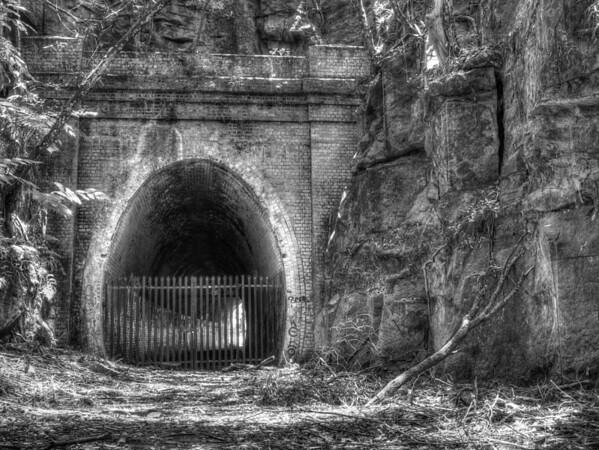 Helensurgh was historically important as part of the original rail line down to the Illawarra coal fields, and some of the original single line tunnels and tracks dating back to the late 1800s are still in place. 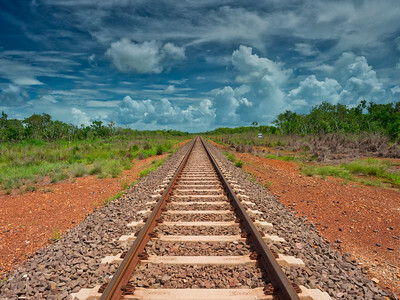 The original rail line has since been replaced by a double track line. The original line, tunnels and even an old station platform serve as a historical reminder of life in the late 19th century. 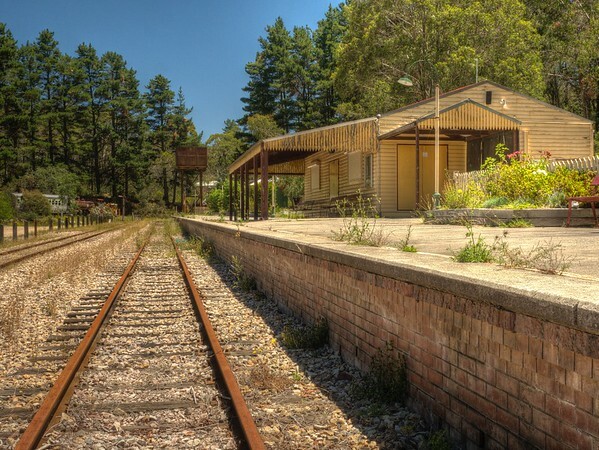 The old Lithgow Zig Zag Railway line in Australia's Blue Mountains operated from 1869 to 1910, after which it was replaced by a new deviation that operates to this day. The Clarence Station was the centre of a railway town during this time, but today the restored station is the main remnant of the old town. Around the old station lie a number of engines, carriages and other rolling stock that formed part of a tourist railway that operated from 1975 until 2012. Many of these items were damaged in the bushfires of 2013. It is possible to wander about the site and view the rolling stock and station, with no fences or signs keeping people out. That said, some areas have asbestos, so it is best to avoid trying to go into any of the rolling stock. The site is a bit overgrown, but represents an important piece of the early settlement beyond the Blue Mountains.